Note. All of these pens have been serviced and are in working order unless otherwise stated. An unused Parker fountain pen in brushed steel with a medium grade nib; it uses cartridges or a converter and both are readily available on the High Street. A lightly used Parker Slimfold fountain pen in black with a fine grade 14 ct gold nib; it is a squeezy-filler and requires ink from a bottle. An unused Hero 7023 fountain pen in pink with a fine grade nib; it uses cartridges or a converter (fitted) and both are readily available on the internet. A lightly used Sheaffer fountain pen in brushed steel with a medium grade nib; it uses cartridges or a converter (fitted) and both are readily available on the High Street. A lightly used Parker 45 fountain pen in blue with a medium grade steel nib; it uses cartridges or a converter (fitted) and both are readily available on the High Street. A used but very functional Eversharp clutch pencil in bronzed metal finish with a gold-plated trim; it has a new eraser under the top cap and uses Parker leads which are readily available on the High Street. A lightly used immaculate-condition Parker ballpoint pen in gold-filled finish in its original box with outer sleeve and leaflet; ballpen refills are readily available on the High Street. A lightly used No-Name fountain pen in black with a fine grade nib; it uses cartridges or a converter and both are readily available on the High Street. A lightly used Sheaffer fountain pen in black laque with a fine grade nib; it uses cartridges or a converter and has a converter fitted. A lightly used Conway Stewart Dinkie fountain pen in red and black marbled finish with a medium grade 14ct gold nib; it is a lever filler and needs ink from a bottle. A lightly used Parker Frontier fountain pen in purple with a brushed steel cap and a medium grade nib; it uses cartridges or a converter and both are readily available on the High Street. A mechanically-sound very functional pencil in red and black marble with bright steel trim; the pencil has spare leads in the magazine. A lightly-used Waterman ballpoint pen in; refills are readily available on the High Street. A lightly used 'The De La Rue' pencil in black with gold-plated trim. A lightly used Parker Insignia ballpoint pen in gold-filled finish; it uses Parker refills which are readily available on the High Street. 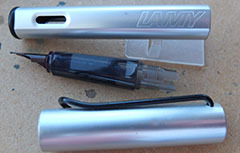 A used Lamy fountain pen in brushed plastic with a medium grade nib; it uses cartridges or a converter and both are readily available on the High Street. A used Zenith pencil in 18ct gold plated; this pencil matches a lot of the safety pens made in Italy in the 1930s and 40s. A used and lightly worn Platignum fountain pen in blue with a brushed steel cap; the pen has a broad grade 14ct gold nib and writes nicely; the pen is a squeezy-filler and requires ink from a bottle. An unused Parker Sonnet fountain pen in brushed steel with a medium grade nib; it uses cartridges or a converter and both are readily available on the High Street. A used fountain pen, ballpen or pencil case in leather/mock leather with a capacity for 12 pens; its in good condition with a couple of small marks. A lightly-used Parker 45 Super fountain pen in brushed steel with a broadish medium grade 14ct gold nib; it uses cartridges or a converter and there is a converter fitted; both cartridges and converters are readily available on the High Street. A lightly used Parker Duofold pencil in blue with gold filled trim; the pencil is in working order with spare leads and a new eraser. 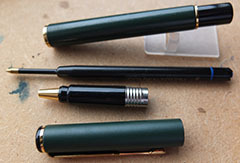 A used but mechanically sound Parker ballpoint pen in green with gold-filled trim; Parker refills are readily available on the High Street. An used but immaculate Cross ballpoint pen in polished steel with a working refill; refills are readily available on the High Street. A lightly used Sheaffer ballpoint pen in red with 'WS' lightly engraved on its side; it uses the modern Sheaffer refills which are readily available on the High Street. A lightly used fountain pen, ballpen or pencil case in orange leather-look finish; it will house one pen. A used Eye Dropper suitable for filling Eye Dropper fountain pens; the rubber bulb has hardened but if you remove it and use your thumb over the end it works just fine. A lightly used Parker Duofold pencil in black with spare leads and a used but serviceable eraser. 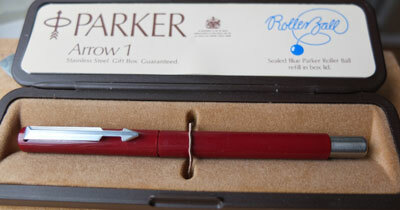 A Parker ballpoint pen in red with a red refill and boxed; this one has been used. A mint unused Parker fountain pen in black with a medium grade nib; it can use cartridges or a converter and there is a converter fitted; I don't think this one has ever been used. A very nice lightly-used Parker Arrow fountain pen in brushed steel with a medium grade nib; it can use cartridges or a converter and there is a converter fitted. A very nice lightly-used Parker Vector fountain pen in black with a medium grade nib; it can use cartridges or a converter and there is a converter fitted; I don't think this one has ever been used. A very nice lightly-used Parker Vector fountain pen in blue with a medium grade nib; it can use cartridges or a converter. A very nice used Waterman pencil in burgundy with gold-plated trim; the pencil has spare leads and a hardened eraser. A very nice used Parker Duofold pencil in black with gold-filled trim and in working order; this pencil still has spare leads and an eraser, albeit a little hard. A new-old-stock unused Waterman fibre-tip pen in matt black finish and in working order; this pen uses the modern Waterman refills and these are readily available. This pen has a new refill fitted. A Cross blister pack of one rolling ball refill in black; these are new-old-stock from a closing-down shop I cleared but I have opened a few and all have been just perfect. Please note I have about a dozen of these available and postage to UK addresses is only £2.00. Two boxes of 8 unused Waterman fountain pen cartridges in blue; these are the standard size ones and not suitable for CF pens; these are new-old-stock from a closing-down shop I cleared. Two boxes of 8 unused Waterman fountain pen cartridges in black; these are the standard size ones and not suitable for CF pens; these are new-old-stock from a closing-down shop I cleared. An opened box of 12 Waterman fibre-tip pen refills in blue; I have tested a few from this box and they work just fine; these are new-old-stock from a closing-down shop I cleared. An unused and mechanically sound Waterman rollerball pen in matt black finish with gold-plated trim; the pen is in super condition and there are no cracks, splits or deep scratches; there is a new rollerball refill fitted and replacements are available from WH Smiths. An unused and mechanically sound Waterman fibretip pen in matt black finish with gold-plated trim; the pen is in super condition and there are no cracks, splits or deep scratches; there is a new refill fitted and replacements are available from WH Smiths. A lightly-used but mechanically sound Messenger rollerball pen and a ballpen in gold-plated finish with gold-plated trim; the pens are in super condition and there are no cracks, splits or deep scratches; there are two new rollerball refills included and replacements are available from WH Smiths; the ballpen uses Parker refills which are readily available. A very nice hardly-used Parker Vector fountain pen, ballpen, and pencil set in black and brushed steel from the 1990s; the pen is a cartridge or converter-filler and has a converter fitted; it has a medium grade nib and writes nicely; boxed too. A very nice used but good leather pen case in black that takes two pens. A very functional and unused Sheaffer ballpen in stainless steel with chrome-plated trim; it did have 'Tesco' printed on the side but that is almost obliterated; it is in working order and mechanically sound.